Hello my name is Jim Chrisawn and I am a fourth generation woodworker and have been a woodworker for the past 40 plus years. I have built everything from custom homes to custom furniture during this time. I moved to Wyoming in 2012 and gave away my workbench to a dear friend and woodworker before moving so one of the first things that I needed to do after settling in was to build a new work bench. In this I needed a new vise. I love the old Record 52 vises and found that they were now very expensive and hard to come by as well. 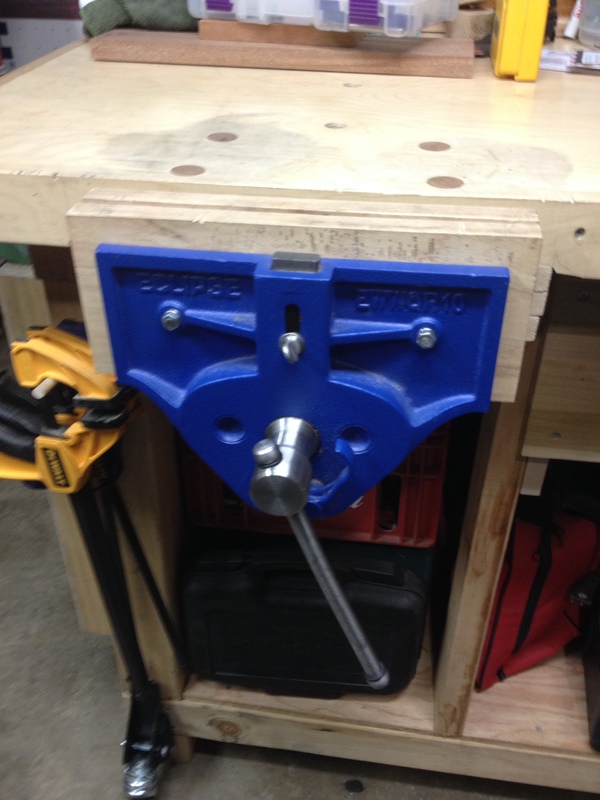 I did a lot of research and decided to try the Eclipse 10″ Quick Release Vise from Highland. I ordered the vise and it arrived promptly and well-packaged. Once unpacked, cleaned, and lubricated I set about installing it on my bench. The installation was straight forward, however be warned this is a heavy vise! Once installed I made vise jaw inserts out of some scrap hickory that I had in the shop. With the 3/4″ inserts installed, the vise opens to a generous 13-1/2″. The quick release lever tension is easily adjusted to suit the user and works great! The jaws close square and secure. Please note that the jaws close at the top first by design. I really like this design feature as it allows me to place the object in the vise, close it, and then make easy adjustments before fully tightening the vise. Once tightened the vise holds the work very securely and squarely. The vise comes with a metal dog that can be lifted into position and held securely with the thumb screw. This is a great addition if you installed bench dogs. I have found the vise a very well made copy of the Record 52D in almost every way. I have been using the vise now daily for nearly a year with no problems or issues. I did make a modification after reading one of Paul Sellers blogs by adding two o-rings to the ends of the tommy bar so it dampens the metal to metal noise you get using the vise. Overall, I am very pleased with this vise and feel it is a quality product even if it isn’t built in the USA. CLICK HERE to learn more about the vise and purchase your own. I have something of a favor to ask. 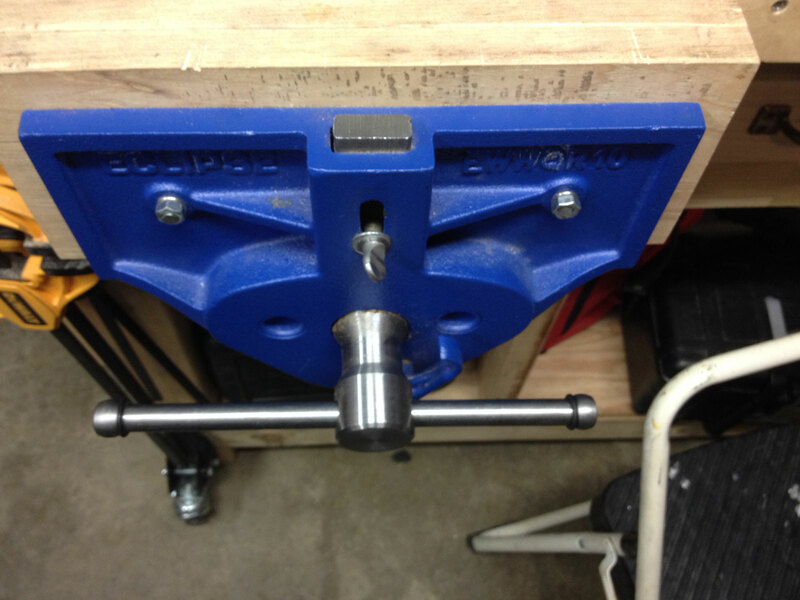 I currently have an old Columbian 10″ vise on my bench. It only has 2 mounting points as opposed to the 4 of the Record/Eclipse. I am building a second bench and plan to buy two 10″ Eclipse vises. One for the new bench for sure, and the second for either the new bench on the end as an end vise,cor as a replacement for the Columbian on my main bench. I wonder if you might have the bolt/mounting point measurements still from your installation? If I can reuse the Columbian vise mounting holes, and just drill two new ones to mount the Eclipse, then I’m using the second vise there. If not, it goes on the end of the new bench. Any help , diagrams, or measurements regarding hole placement of the Eclipse would be very appreciated.